"Air control" and "Air traffic" redirect here. For the military concept, see Air supremacy. For the English band, see Air Traffic. For the Canadian band, see Air Traffic Control (band). For the video game, see Air Control (video game). Air traffic control (ATC) is a service provided by ground-based air traffic controllers who direct aircraft on the ground and through controlled airspace, and can provide advisory services to aircraft in non-controlled airspace. The primary purpose of ATC worldwide is to prevent collisions, organize and expedite the flow of air traffic, and provide information and other support for pilots. In some countries, ATC plays a security or defensive role, or is operated by the military. Pursuant to requirements of the International Civil Aviation Organization (ICAO), ATC operations are conducted either in the English language or the language used by the station on the ground. In practice, the native language for a region is normally used; however, the English language must be used upon request. In 1920, Croydon Airport, London was the first airport in the world to introduce air traffic control. In the United States, air traffic control developed three divisions. The first of air mail radio stations (AMRS) was created in 1922 after World War I when the U.S. Post Office began using techniques developed by the Army to direct and track the movements of reconnaissance aircraft. Over time, the AMRS morphed into flight service stations. Today's flight service stations do not issue control instructions, but provide pilots with many other flight related informational services. They do relay control instructions from ATC in areas where flight service is the only facility with radio or phone coverage. The first airport traffic control tower, regulating arrivals, departures and surface movement of aircraft at a specific airport, opened in Cleveland in 1930. Approach/departure control facilities were created after adoption of radar in the 1950s to monitor and control the busy airspace around larger airports. The first air route traffic control center, which directs the movement of aircraft between departure and destination was opened in Newark, NJ in 1935, followed in 1936 by Chicago and Cleveland. The primary method of controlling the immediate airport environment is visual observation from the airport control tower. The tower is a tall, windowed structure located on the airport grounds. Air traffic controllers are responsible for the separation and efficient movement of aircraft and vehicles operating on the taxiways and runways of the airport itself, and aircraft in the air near the airport, generally 5 to 10 nautical miles (9 to 18 km) depending on the airport procedures. Surveillance displays are also available to controllers at larger airports to assist with controlling air traffic. Controllers may use a radar system called secondary surveillance radar for airborne traffic approaching and departing. These displays include a map of the area, the position of various aircraft, and data tags that include aircraft identification, speed, altitude, and other information described in local procedures. In adverse weather conditions the tower controllers may also use surface movement radar (SMR), surface movement guidance and control systems (SMGCS) or advanced SMGCS to control traffic on the manoeuvring area (taxiways and runway). 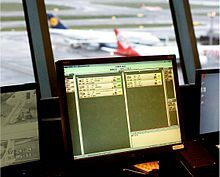 The areas of responsibility for tower controllers fall into three general operational disciplines: local control or air control, ground control, and flight data / clearance delivery—other categories, such as Apron control or ground movement planner, may exist at extremely busy airports. While each tower may have unique airport-specific procedures, such as multiple teams of controllers ('crews') at major or complex airports with multiple runways, the following provides a general concept of the delegation of responsibilities within the tower environment. Remote and virtual tower (RVT) is a system based on air traffic controllers being located somewhere other than at the local airport tower and still able to provide air traffic control services. Displays for the air traffic controllers may be live video, synthetic images based on surveillance sensor data, or both. Ground control (sometimes known as ground movement control) is responsible for the airport "movement" areas, as well as areas not released to the airlines or other users. This generally includes all taxiways, inactive runways, holding areas, and some transitional aprons or intersections where aircraft arrive, having vacated the runway or departure gate. Exact areas and control responsibilities are clearly defined in local documents and agreements at each airport. Any aircraft, vehicle, or person walking or working in these areas is required to have clearance from ground control. This is normally done via VHF/UHF radio, but there may be special cases where other procedures are used. Aircraft or vehicles without radios must respond to ATC instructions via aviation light signals or else be led by vehicles with radios. People working on the airport surface normally have a communications link through which they can communicate with ground control, commonly either by handheld radio or even cell phone. Ground control is vital to the smooth operation of the airport, because this position impacts the sequencing of departure aircraft, affecting the safety and efficiency of the airport's operation. Some busier airports have surface movement radar (SMR), such as, ASDE-3, AMASS or ASDE-X, designed to display aircraft and vehicles on the ground. These are used by ground control as an additional tool to control ground traffic, particularly at night or in poor visibility. There are a wide range of capabilities on these systems as they are being modernized. Older systems will display a map of the airport and the target. Newer systems include the capability to display higher quality mapping, radar target, data blocks, and safety alerts, and to interface with other systems such as digital flight strips. Air control (known to pilots as "tower" or "tower control") is responsible for the active runway surfaces. Air control clears aircraft for takeoff or landing, ensuring that prescribed runway separation will exist at all times. If the air controller detects any unsafe conditions, a landing aircraft may be instructed to "go-around" and be re-sequenced into the landing pattern. This re-sequencing will depend on the type of flight and may be handled by the air controller, approach or terminal area controller. Within the tower, a highly disciplined communications process between air control and ground control is an absolute necessity. Air control must ensure that ground control is aware of any operations that will impact the taxiways, and work with the approach radar controllers to create "gaps" in the arrival traffic to allow taxiing traffic to cross runways and to allow departing aircraft to take off. Ground control need to keep the air controllers aware of the traffic flow towards their runways in order to maximise runway utilisation through effective approach spacing. Crew resource management (CRM) procedures are often used to ensure this communication process is efficient and clear. Within ATC, it is usually known as TRM (Team Resource Management) and the level of focus on TRM varies within different ATC organisations. Clearance delivery is the position that issues route clearances to aircraft, typically before they commence taxiing. These clearances contain details of the route that the aircraft is expected to fly after departure. Clearance delivery or, at busy airports, Ground Movement Planner (GMP) or Traffic Management Coordinator (TMC) will, if necessary, coordinate with the relevant radar centre or flow control unit to obtain releases for aircraft. At busy airports, these releases are often automatic and are controlled by local agreements allowing "free-flow" departures. When weather or extremely high demand for a certain airport or airspace becomes a factor, there may be ground "stops" (or "slot delays") or re-routes may be necessary to ensure the system does not get overloaded. The primary responsibility of clearance delivery is to ensure that the aircraft have the correct aerodrome information, such as weather and airport conditions, the correct route after departure and time restrictions relating to that flight. This information is also coordinated with the relevant radar centre or flow control unit and ground control in order to ensure that the aircraft reaches the runway in time to meet the time restriction provided by the relevant unit. At some airports, clearance delivery also plans aircraft push-backs and engine starts, in which case it is known as the Ground Movement Planner (GMP): this position is particularly important at heavily congested airports to prevent taxiway and apron gridlock. Flight data (which is routinely combined with clearance delivery) is the position that is responsible for ensuring that both controllers and pilots have the most current information: pertinent weather changes, outages, airport ground delays/ground stops, runway closures, etc. Flight data may inform the pilots using a recorded continuous loop on a specific frequency known as the automatic terminal information service (ATIS). Many airports have a radar control facility that is associated with the airport. In most countries, this is referred to as terminal control; in the U.S., it is referred to as a TRACON (terminal radar approach control). While every airport varies, terminal controllers usually handle traffic in a 30-to-50-nautical-mile (56 to 93 km) radius from the airport. Where there are many busy airports close together, one consolidated terminal control center may service all the airports. The airspace boundaries and altitudes assigned to a terminal control center, which vary widely from airport to airport, are based on factors such as traffic flows, neighboring airports and terrain. A large and complex example was the London Terminal Control Centre, which controlled traffic for five main London airports up to 20,000 feet (6,100 m) and out to 100 nautical miles (190 km). Terminal controllers are responsible for providing all ATC services within their airspace. Traffic flow is broadly divided into departures, arrivals, and overflights. As aircraft move in and out of the terminal airspace, they are handed off to the next appropriate control facility (a control tower, an en-route control facility, or a bordering terminal or approach control). Terminal control is responsible for ensuring that aircraft are at an appropriate altitude when they are handed off, and that aircraft arrive at a suitable rate for landing. Not all airports have a radar approach or terminal control available. In this case, the en-route center or a neighboring terminal or approach control may co-ordinate directly with the tower on the airport and vector inbound aircraft to a position from where they can land visually. At some of these airports, the tower may provide a non-radar procedural approach service to arriving aircraft handed over from a radar unit before they are visual to land. Some units also have a dedicated approach unit which can provide the procedural approach service either all the time or for any periods of radar outage for any reason. In the U.S., TRACONs are additionally designated by a three-digit alphanumeric code. For example, the Chicago TRACON is designated C90. ATC provides services to aircraft in flight between airports as well. Pilots fly under one of two sets of rules for separation: visual flight rules (VFR) or instrument flight rules (IFR). Air traffic controllers have different responsibilities to aircraft operating under the different sets of rules. While IFR flights are under positive control, in the US VFR pilots can request flight following, which provides traffic advisory services on a time permitting basis and may also provide assistance in avoiding areas of weather and flight restrictions. Across Europe, pilots may request for a "Flight Information Service", which is similar to flight following. In the UK it is known as a "traffic service". En-route air traffic controllers issue clearances and instructions for airborne aircraft, and pilots are required to comply with these instructions. En-route controllers also provide air traffic control services to many smaller airports around the country, including clearance off of the ground and clearance for approach to an airport. Controllers adhere to a set of separation standards that define the minimum distance allowed between aircraft. These distances vary depending on the equipment and procedures used in providing ATC services. En-route air traffic controllers work in facilities called air traffic control centers, each of which is commonly referred to as a "center". The United States uses the equivalent term air route traffic control center (ARTCC). Each center is responsible for many thousands of square miles of airspace (known as a flight information region) and for the airports within that airspace. Centers control IFR aircraft from the time they depart from an airport or terminal area's airspace to the time they arrive at another airport or terminal area's airspace. Centers may also "pick up" VFR aircraft that are already airborne and integrate them into the IFR system. These aircraft must, however, remain VFR until the center provides a clearance. Center controllers are responsible for issuing instructions to pilots to climb their aircraft to their assigned altitude while, at the same time, ensuring that the aircraft is properly separated from all other aircraft in the immediate area. Additionally, the aircraft must be placed in a flow consistent with the aircraft's route of flight. This effort is complicated by crossing traffic, severe weather, special missions that require large airspace allocations, and traffic density. When the aircraft approaches its destination, the center is responsible for issuing instructions to pilots so that they will meet altitude restrictions by specific points, as well as providing many destination airports with a traffic flow, which prohibits all of the arrivals being "bunched together". These "flow restrictions" often begin in the middle of the route, as controllers will position aircraft landing in the same destination so that when the aircraft are close to their destination they are sequenced. As an aircraft reaches the boundary of a center's control area it is "handed off" or "handed over" to the next Area Control Center. In some cases this "hand-off" process involves a transfer of identification and details between controllers so that air traffic control services can be provided in a seamless manner; in other cases local agreements may allow "silent handovers" such that the receiving center does not require any co-ordination if traffic is presented in an agreed manner. After the hand-off, the aircraft is given a frequency change and begins talking to the next controller. This process continues until the aircraft is handed off to a terminal controller ("approach"). Since centers control a large airspace area, they will typically use long range radar that has the capability, at higher altitudes, to see aircraft within 200 nautical miles (370 km) of the radar antenna. They may also use TRACON radar data to control when it provides a better "picture" of the traffic or when it can fill in a portion of the area not covered by the long range radar. In the U.S. system, at higher altitudes, over 90% of the U.S. airspace is covered by radar and often by multiple radar systems; however, coverage may be inconsistent at lower altitudes used by unpressurized aircraft due to high terrain or distance from radar facilities. A center may require numerous radar systems to cover the airspace assigned to them, and may also rely on pilot position reports from aircraft flying below the floor of radar coverage. This results in a large amount of data being available to the controller. To address this, automation systems have been designed that consolidate the radar data for the controller. This consolidation includes eliminating duplicate radar returns, ensuring the best radar for each geographical area is providing the data, and displaying the data in an effective format. Centers also exercise control over traffic travelling over the world's ocean areas. These areas are also flight information regions (FIRs). Because there are no radar systems available for oceanic control, oceanic controllers provide ATC services using procedural control. These procedures use aircraft position reports, time, altitude, distance, and speed to ensure separation. Controllers record information on flight progress strips and in specially developed oceanic computer systems as aircraft report positions. This process requires that aircraft be separated by greater distances, which reduces the overall capacity for any given route. See for example the North Atlantic Track system. Some air navigation service providers (e.g., Airservices Australia, the U.S. Federal Aviation Administration, Nav Canada, etc.) have implemented automatic dependent surveillance – broadcast (ADS-B) as part of their surveillance capability. This new technology reverses the radar concept. Instead of radar "finding" a target by interrogating the transponder, the ADS-equipped aircraft sends a position report as determined by the navigation equipment on board the aircraft. Normally, ADS operates in the "contract" mode where the aircraft reports a position, automatically or initiated by the pilot, based on a predetermined time interval. It is also possible for controllers to request more frequent reports to more quickly establish aircraft position for specific reasons. However, since the cost for each report is charged by the ADS service providers to the company operating the aircraft,[disputed – discuss] more frequent reports are not commonly requested except in emergency situations. ADS is significant because it can be used where it is not possible to locate the infrastructure for a radar system (e.g., over water). Computerized radar displays are now being designed to accept ADS inputs as part of the display. This technology is currently used in portions of the North Atlantic and the Pacific by a variety of states who share responsibility for the control of this airspace. Precision approach radars (PAR) are commonly used by military controllers of air forces of several countries, to assist the pilot in final phases of landing in places where instrument landing system and other sophisticated airborne equipment are unavailable to assist the pilots in marginal or near zero visibility conditions. This procedure is also called talkdowns. A radar archive system (RAS) keeps an electronic record of all radar information, preserving it for a few weeks. This information can be useful for search and rescue. When an aircraft has 'disappeared' from radar screens, a controller can review the last radar returns from the aircraft to determine its likely position. For example, see this crash report. RAS is also useful to technicians who are maintaining radar systems. The mapping of flights in real-time is based on the air traffic control system. In 1991, data on the location of aircraft was made available by the Federal Aviation Administration to the airline industry. The National Business Aviation Association (NBAA), the General Aviation Manufacturers Association, the Aircraft Owners and Pilots Association, the Helicopter Association International, and the National Air Transportation Association petitioned the FAA to make ASDI information available on a "need-to-know" basis. Subsequently, NBAA advocated the broad-scale dissemination of air traffic data. The Aircraft Situational Display to Industry (ASDI) system now conveys up-to-date flight information to the airline industry and the public. Some companies that distribute ASDI information are FlightExplorer, FlightView, and FlyteComm. Each company maintains a website that provides free updated information to the public on flight status. Stand-alone programs are also available for displaying the geographic location of airborne IFR (instrument flight rules) air traffic anywhere in the FAA air traffic system. Positions are reported for both commercial and general aviation traffic. The programs can overlay air traffic with a wide selection of maps such as, geo-political boundaries, air traffic control center boundaries, high altitude jet routes, satellite cloud & radar imagery. For more information see Air traffic flow management. The day-to-day problems faced by the air traffic control system are primarily related to the volume of air traffic demand placed on the system and weather. Several factors dictate the amount of traffic that can land at an airport in a given amount of time. Each landing aircraft must touch down, slow, and exit the runway before the next crosses the approach end of the runway. This process requires at least one and up to four minutes for each aircraft. Allowing for departures between arrivals, each runway can thus handle about 30 arrivals per hour. A large airport with two arrival runways can handle about 60 arrivals per hour in good weather. Problems begin when airlines schedule more arrivals into an airport than can be physically handled, or when delays elsewhere cause groups of aircraft – that would otherwise be separated in time – to arrive simultaneously. Aircraft must then be delayed in the air by holding over specified locations until they may be safely sequenced to the runway. Up until the 1990s, holding, which has significant environmental and cost implications, was a routine occurrence at many airports. Advances in computers now allow the sequencing of planes hours in advance. Thus, planes may be delayed before they even take off (by being given a "slot"), or may reduce speed in flight and proceed more slowly thus significantly reducing the amount of holding. Air traffic control errors occur when the separation (either vertical or horizontal) between airborne aircraft falls below the minimum prescribed separation set (for the domestic United States) by the US Federal Aviation Administration. Separation minimums for terminal control areas (TCAs) around airports are lower than en-route standards. Errors generally occur during periods following times of intense activity, when controllers tend to relax and overlook the presence of traffic and conditions that lead to loss of minimum separation. Beyond runway capacity issues, the weather is a major factor in traffic capacity. Rain, ice, snow or hail on the runway cause landing aircraft to take longer to slow and exit, thus reducing the safe arrival rate and requiring more space between landing aircraft. Fog also requires a decrease in the landing rate. These, in turn, increase airborne delay for holding aircraft. If more aircraft are scheduled than can be safely and efficiently held in the air, a ground delay program may be established, delaying aircraft on the ground before departure due to conditions at the arrival airport. In Area Control Centers, a major weather problem is thunderstorms, which present a variety of hazards to aircraft. Aircraft will deviate around storms, reducing the capacity of the en-route system by requiring more space per aircraft or causing congestion as many aircraft try to move through a single hole in a line of thunderstorms. Occasionally weather considerations cause delays to aircraft prior to their departure as routes are closed by thunderstorms. Much money has been spent on creating software to streamline this process. However, at some ACCs, air traffic controllers still record data for each flight on strips of paper and personally coordinate their paths. In newer sites, these flight progress strips have been replaced by electronic data presented on computer screens. As new equipment is brought in, more and more sites are upgrading away from paper flight strips. A prerequisite to safe air traffic separation is the assignment and use of distinctive call signs. These are permanently allocated by ICAO on request usually to scheduled flights and some air forces and other military services for military flights. There are written callsigns with a 3-letter combination like KLM, BAW, VLG followed by the flight number, like AAL872, VLG1011. As such they appear on flight plans and ATC radar labels. There are also the audio or Radiotelephony callsigns used on the radio contact between pilots and air traffic control. These are not always identical to their written counterparts. An example of an audio callsign would be "Speedbird 832", instead of the written "BAW832". This is used to reduce the chance of confusion between ATC and the aircraft. By default, the callsign for any other flight is the registration number (tail number) of the aircraft, such as "N12345", "C-GABC" or "EC-IZD". The short Radiotelephony callsigns for these tail numbers is the last 3 letters using the NATO phonetic alphabet (i.e. ABC spoken alpha-bravo-charlie for C-GABC) or the last 3 numbers (i.e. three-four-five for N12345). In the United States, the prefix may be an aircraft type, model or manufacturer in place of the first registration character, for example, "N11842" could become "Cessna 842". This abbreviation is only allowed after communications have been established in each sector. Before around 1980 International Air Transport Association (IATA) and ICAO were using the same 2-letter callsigns. Due to the larger number of new airlines after deregulation, ICAO established the 3-letter callsigns as mentioned above. The IATA callsigns are currently used in aerodromes on the announcement tables but never used any longer in air traffic control. For example, AA is the IATA callsign for American Airlines – ATC equivalent AAL. Other examples include LY/ELY for El Al, DL/DAL for Delta Air Lines, VY/VLG for Vueling Airlines, JL/JAL for Japan Airlines, NH/ANA for All Nippon Airways, etc. Flight numbers in regular commercial flights are designated by the aircraft operator and identical callsign might be used for the same scheduled journey each day it is operated, even if the departure time varies a little across different days of the week. The callsign of the return flight often differs only by the final digit from the outbound flight. Generally, airline flight numbers are even if eastbound, and odd if westbound. In order to reduce the possibility of two callsigns on one frequency at any time sounding too similar, a number of airlines, particularly in Europe, have started using alphanumeric callsigns that are not based on flight numbers (i.e. DLH23LG, spoken as Lufthansa-two-three-lima-golf, to prevent confusion between incoming DLH23 and outgoing DLH24 in the same frequency). Additionally, it is the right of the air traffic controller to change the 'audio' callsign for the period the flight is in his sector if there is a risk of confusion, usually choosing the tail number instead. Many technologies are used in air traffic control systems. Primary and secondary radar are used to enhance a controller's situation awareness within his assigned airspace – all types of aircraft send back primary echoes of varying sizes to controllers' screens as radar energy is bounced off their skins, and transponder-equipped aircraft reply to secondary radar interrogations by giving an ID (Mode A), an altitude (Mode C) and/or a unique callsign (Mode S). Certain types of weather may also register on the radar screen. These inputs, added to data from other radars, are correlated to build the air situation. Some basic processing occurs on the radar tracks, such as calculating ground speed and magnetic headings. Usually, a flight data processing system manages all the flight plan related data, incorporating – in a low or high degree – the information of the track once the correlation between them (flight plan and track) is established. All this information is distributed to modern operational display systems, making it available to controllers. The FAA has spent over US$3 billion on software, but a fully automated system is still over the horizon. In 2002 the UK brought a new area control centre into service at the London Area Control Centre, Swanwick, Hampshire, relieving a busy suburban centre at West Drayton, Middlesex, north of London Heathrow Airport. 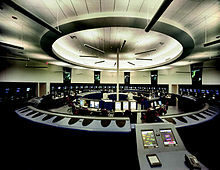 Software from Lockheed-Martin predominates at the London Area Control Centre. However, the centre was initially troubled by software and communications problems causing delays and occasional shutdowns. Flight data processing systems: this is the system (usually one per center) that processes all the information related to the flight (the flight plan), typically in the time horizon from gate to gate (airport departure/arrival gates). It uses such processed information to invoke other flight plan related tools (such as e.g. MTCD), and distributes such processed information to all the stakeholders (air traffic controllers, collateral centers, airports, etc.). Short-term conflict alert (STCA) that checks possible conflicting trajectories in a time horizon of about 2 or 3 minutes (or even less in approach context – 35 seconds in the French Roissy & Orly approach centres) and alerts the controller prior to the loss of separation. The algorithms used may also provide in some systems a possible vectoring solution, that is, the manner in which to turn, descend, increase/decrease speed, or climb the aircraft in order to avoid infringing the minimum safety distance or altitude clearance. Minimum safe altitude warning (MSAW): a tool that alerts the controller if an aircraft appears to be flying too low to the ground or will impact terrain based on its current altitude and heading. System coordination (SYSCO) to enable controller to negotiate the release of flights from one sector to another. Area penetration warning (APW) to inform a controller that a flight will penetrate a restricted area. Arrival and departure manager to help sequence the takeoff and landing of aircraft. The departure manager (DMAN): A system aid for the ATC at airports, that calculates a planned departure flow with the goal to maintain an optimal throughput at the runway, reduce queuing at holding point and distribute the information to various stakeholders at the airport (i.e. the airline, ground handling and air traffic control (ATC)). The arrival manager (AMAN): A system aid for the ATC at airports, that calculates a planned arrival flow with the goal to maintain an optimal throughput at the runway, reduce arrival queuing and distribute the information to various stakeholders. Passive final approach spacing tool (pFAST), a CTAS tool, provides runway assignment and sequence number advisories to terminal controllers to improve the arrival rate at congested airports. pFAST was deployed and operational at five US TRACONs before being cancelled. NASA research included an active FAST capability that also provided vector and speed advisories to implement the runway and sequence advisories. Converging runway display aid (CRDA) enables approach controllers to run two final approaches that intersect and make sure that go arounds are minimized. Center TRACON automation system (CTAS) is a suite of human centered decision support tools developed by NASA Ames Research Center. Several of the CTAS tools have been field tested and transitioned to the FAA for operational evaluation and use. Some of the CTAS tools are: traffic management advisor (TMA), passive final approach spacing tool (pFAST), collaborative arrival planning (CAP), direct-to (D2), en route descent advisor (EDA) and multi-center TMA. The software is running on Linux. In the US, user request evaluation tool (URET) takes paper strips out of the equation for en route controllers at ARTCCs by providing a display that shows all aircraft that are either in or currently routed into the sector. In Europe, several MTCD tools are available: iFACTS (NATS), VAFORIT (DFS), new FDPS (MUAC). The SESAR programme should soon launch new MTCD concepts. URET and MTCD provide conflict advisories up to 30 minutes in advance and have a suite of assistance tools that assist in evaluating resolution options and pilot requests. Mode S: provides a data downlink of flight parameters via secondary surveillance radars allowing radar processing systems and therefore controllers to see various data on a flight, including airframe unique id (24-bits encoded), indicated airspeed and flight director selected level, amongst others. CPDLC: controller-pilot data link communications – allows digital messages to be sent between controllers and pilots, avoiding the need to use radiotelephony. It is especially useful in areas where difficult-to-use HF radiotelephony was previously used for communication with aircraft, e.g. oceans. This is currently in use in various parts of the world including the Atlantic and Pacific oceans. ADS-B: automatic dependent surveillance broadcast – provides a data downlink of various flight parameters to air traffic control systems via the transponder (1090 MHz) and reception of those data by other aircraft in the vicinity. The most important is the aircraft's latitude, longitude and level: such data can be utilized to create a radar-like display of aircraft for controllers and thus allows a form of pseudo-radar control to be done in areas where the installation of radar is either prohibitive on the grounds of low traffic levels, or technically not feasible (e.g. oceans). This is currently in use in Australia, Canada and parts of the Pacific Ocean and Alaska. A system of electronic flight strips replacing the old paper strips is being used by several service providers, such as Nav Canada, MASUAC, DFS, DECEA. E-strips allows controllers to manage electronic flight data online without paper strips, reducing the need for manual functions, creating new tools and reducing the ATCO's workload. The firsts electronic flight strips systems were independently and simultaneously invented and implemented by Nav Canada and Saipher ATC in 1999. The Nav Canada system known as EXCDS and rebranded in 2011 to NAVCANstrips and Saipher's first generation system known as SGTC, which is now being updated by its 2nd generation system, the TATIC TWR. DECEA in Brazil is the world's largest user of tower e-strips system, ranging from very small airports up to the busiest ones, taking the advantage of real time information and data collection from each of more than 150 sites for use in air traffic flow management (ATFM), billing and statistics. Screen content recording: Hardware or software based recording function which is part of most modern automation system and that captures the screen content shown to the ATCO. Such recordings are used for a later replay together with audio recording for investigations and post event analysis. Communication navigation surveillance / air traffic management (CNS/ATM) systems are communications, navigation, and surveillance systems, employing digital technologies, including satellite systems together with various levels of automation, applied in support of a seamless global air traffic management system. Belarus – Republican Unitary Enterprise "Белаэронавигация (Belarusian Air Navigation)"
Dominican Republic – Instituto Dominicano de Aviación Civil (IDAC) "Dominican Institute of Civil Aviation"
Russia – Federal State Unitary Enterprise "State ATM Corporation"
In the United States, some alterations to traffic control procedures are being examined. The Next Generation Air Transportation System examines how to overhaul the United States national airspace system. Free flight is a developing air traffic control method that uses no centralized control (e.g. air traffic controllers). Instead, parts of airspace are reserved dynamically and automatically in a distributed way using computer communication to ensure the required separation between aircraft. In Europe, the SESAR (Single European Sky ATM Research) programme plans to develop new methods, technologies, procedures, and systems to accommodate future (2020 and beyond) air traffic needs. Change in regulation in admittance for possible A.T.C. 's regarding their eye-refraction and correction thereof by technology has been proposed. Many countries have also privatized or corporatized their air navigation service providers. There are several models that can be used for ATC service providers. The first is to have the ATC services be part of a government agency as is currently the case in the United States. The problem with this model is that funding can be inconsistent and can disrupt the development and operation of services. Sometimes funding can disappear when lawmakers cannot approve budgets in time. Both proponents and opponents of privatization recognize that stable funding is one of the major factors for successful upgrades of ATC infrastructure. Some of the funding issues include sequestration and politicization of projects. Proponents argue that moving ATC services to a private corporation could stabilize funding over the long term which will result in more predictable planning and rollout of new technology as well as training of personnel. Another model is to have ATC services provided by a government corporation. This model is used in Germany, where funding is obtained through user fees. Yet another model is to have a for-profit corporation operate ATC services. This is the model used in the United Kingdom, but there have been several issues with the system there including a large-scale failure in December 2014 which caused delays and cancellations and has been attributed to cost-cutting measures put in place by this corporation. In fact, earlier that year, the corporation owned by the German government won the bid to provide ATC services for Gatwick Airport in the United Kingdom. The last model, which is often the suggested model for the United States to transition to is to have a non-profit organization that would handle ATC services as is used in Canada. The Canadian system is the one most often used as a model by proponents of privatization. Air traffic control privatization has been successful in Canada with the creation of Nav Canada, a private nonprofit organization which has reduced costs and has allowed new technologies to be deployed faster due to the elimination of much of the bureaucratic red tape. This has resulted in shorter flights and less fuel usage. It has also resulted in flights being safer due to new technology. Nav Canada is funded from fees that are collected from the airlines based on the weight of the aircraft and the distance flown. FAA control tower operators (CTO) / air traffic controllers use FAA Order 7110.65 as the authority for all procedures regarding air traffic. For more information regarding air traffic control rules and regulations, refer to the FAA's website. ^ "FAA 7110.65 2-1-1". Archived from the original on June 7, 2010. ^ a b "IDAO FAQ". Archived from the original on February 20, 2009. Retrieved March 3, 2009. ^ Green Jersey Web Design. "Heritage Locations – South East – Surrey – Croydon Airport". Retrieved July 3, 2015. ^ "Terminal Radar Approach Control Facilities (TRACON)". Federal Aviation Administration. Retrieved February 22, 2014. ^ "What is an Abbreviated Aircraft Call Sign?*". ATC Communication. Retrieved July 3, 2015. ^ "Air Traffic Control". Retrieved December 4, 2012. ^ "Le filet de sauvegarde resserre ses mailles" (PDF). dgac.fr (in French). Archived from the original (PDF) on March 27, 2009. ^ "Technical Sessions". usenix.org. Retrieved December 5, 2010. ^ "Technology Solutions – Integrated Information Display System (IIDS) – Extended Computer Display System (EXCDS)". NAV CANADA. Archived from the original on June 16, 2004. ^ "Solutions using Epiphan products". Epiphan Video capture, stream, record. Retrieved July 3, 2015. ^ "CNS/ATM SYSTEMS" (PDF). icao.int. p. 10. Archived from the original (PDF) on November 9, 2011. ^ "Acerca de ENAIRE – ENAIRE – Información corporativa". Archived from the original on July 4, 2015. Retrieved July 3, 2015. ^ "Wired 4.04: Free Flight". Retrieved July 3, 2015. ^ McDougall, Glen; Roberts, Alasdair S (August 15, 2007). "Commercializing Air Traffic Control: Have the Reforms Worked?". Canadian Public Administration: Vol. 51, No. 1, pp. 45–69, 2009. SSRN 1317450. ^ American Federation of Government Employees; et al. "FAA Labor Unions Oppose ATC Privatization" (PDF). Professional Aviation Safety Specialists. Retrieved November 25, 2016. ^ Rinaldi, Paul (2015). "Safety and Efficiency Must Remain the Main Mission". The Journal of Air Traffic Control. 57 (2): 21–23. ^ Crichton, John (2015). "The NAV CANADA Model". The Journal of Air Traffic Control. 57 (2): 33–35. ^ "Air Traffic Plans and Publications" (PDF). FAA. Retrieved December 5, 2010. Wikimedia Commons has media related to Air traffic control.